Phoenix garage doors repair offers efficient, reliable and affordable services for residential and commercial garage doors. We not only attend your calls for repair but also carry out planned maintenance that result in reducing chances of emergency situations. In case of emergency we attend client calls promptly and earnestly. Our skilled and experienced technicians are always fully stocked with service vans that allow us to service any brand door or opener in a timely manner. Repair and service of garage doors and garage door openers is what we excel in. Our skilled technicians are seasoned professionals at diagnosing and fixing problems with any brand garage door or garage door openers. Call us when your garage door or garage door opener needs repair or service. We can repair and service any make or model garage door or garage door opener. We also stock some hard to find replacement parts for discontinued brands and models of garage doors and garage door openers. Phoenix garage doors repair provides same day service if appointment is booked before noon and 24 Hour emergency services. 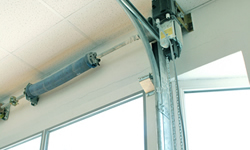 We also can upon requirement offer a wide assortment and brands of garage door parts and accessories.